A complete copper alloy 'Venus penny' Jetton dating from AD 1490-1550. Mitchiner (1988:269 no. 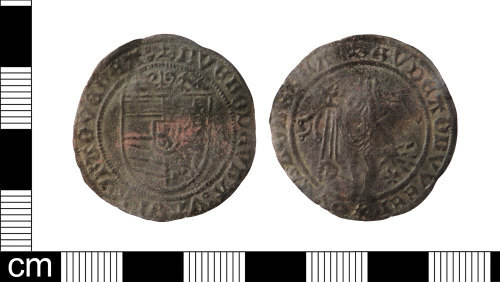 835-837) Mitchiner (1988:265) writes "The 'Venus pennies' were a popular series of jettons, or reckoning counters, that were made for the merchants of Antwerp during a period when this city was the flourishing principal commercial centre of the land, and were circulated amongst the merchant classes during the first half of the sixteenth century. Obverse description: Austro-Burgundian shield in five parts: Three Lis (Burgundy modern), 3 horizontal lines, fesse (Austria), 3 oblique lines (Burgundy ancient), Brabant - lion rampant (Brabant), overall a lion rampant the Escutcheon of Flanders. Crown above. Reverse description: Woman (Venus) holding a spray of three flowers, with bird in right raised right hand, and a large petalled flower by her feet, in lowered left hand she holds a pot from which she waters flowers in the field. Dimensions: diameter: 29.78mm, weigh 1.63g.